There were a few important reports on the economy released this morning. 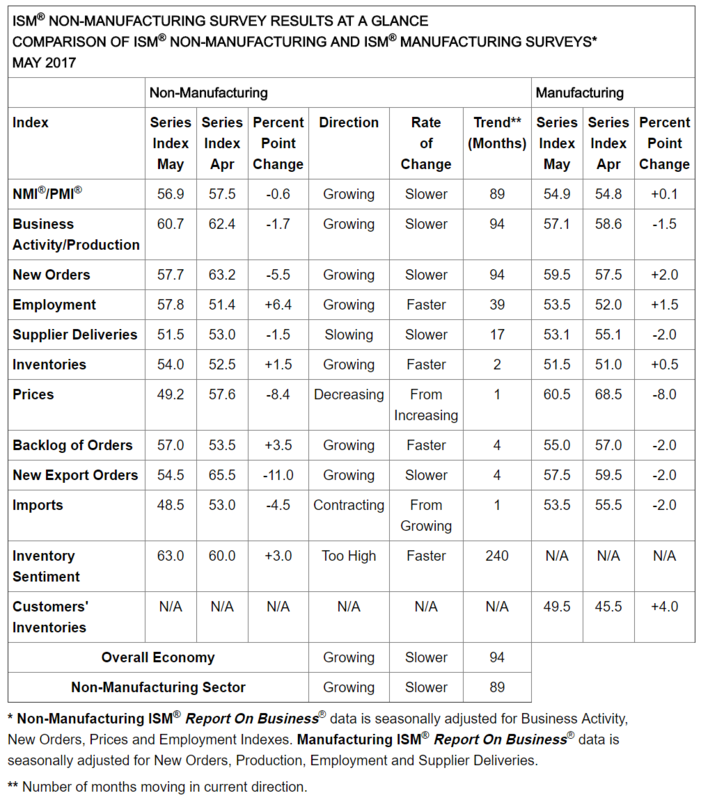 First, the purchasing managers' index (PMI) from IHS Markit for the U.S. services sector, which accounts for a much larger share of the overall economy than manufacturing, ended May at 53.6. That was the second monthly improvement in a row but slightly worse than economists had anticipated. Under the hood, new orders expanded at the fastest pace since January and job creation accelerated to a 3-month high. Chris Williamson, chief business economist at IHS Markit, added that “the key message from the PMI is that the economy is enjoying steady, albeit unspectacular, growth, and that the pace of expansion has been slowly lifting higher in recent months.” Similarly, the Institute for Supply Management’s (ISM’s) non-manufacturing index, also released this morning, edged lower in May to 56.9, in line with expectations. 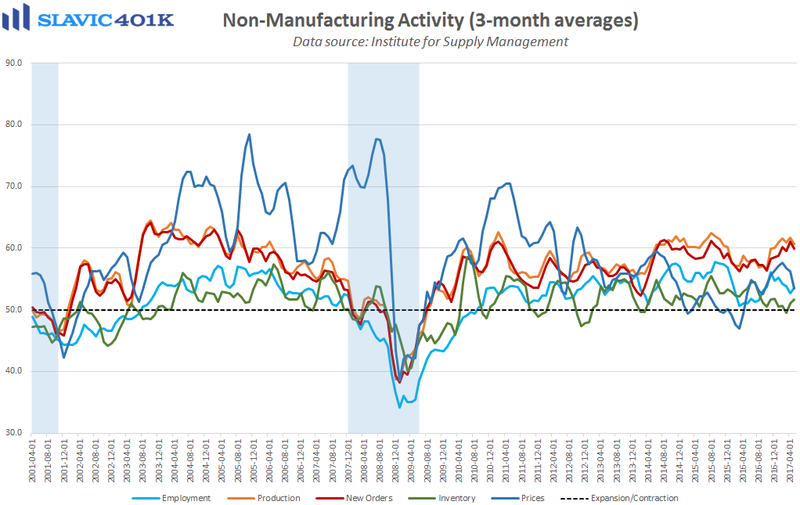 Measures of production and new orders deteriorated last month but gauges of inventories, hiring, and inflation all improved. 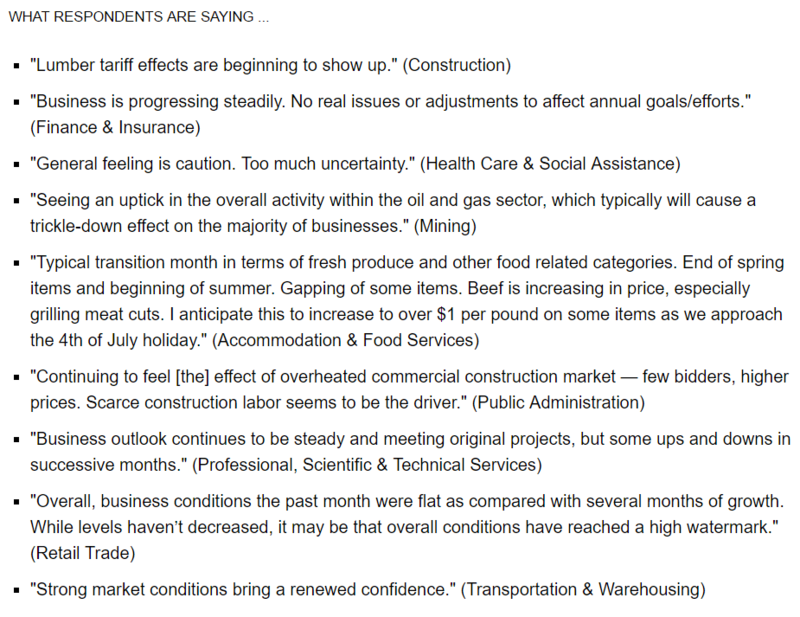 Comments from surveyed managers were somewhat mixed in May. 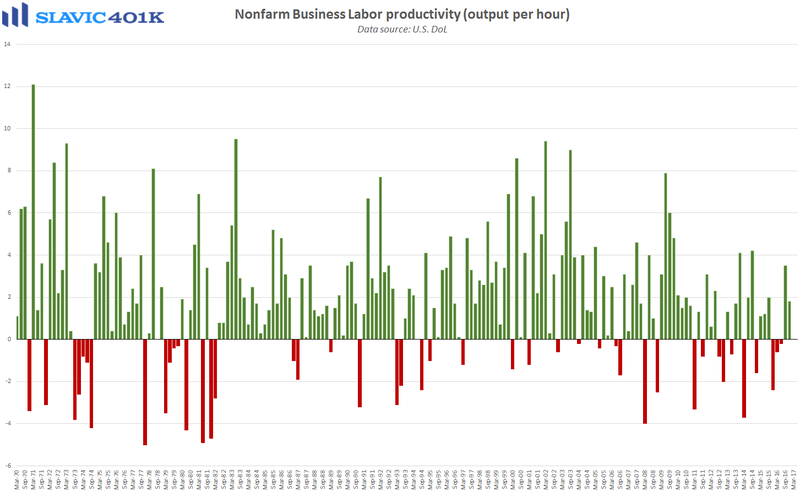 Elsewhere, a report from the Bureau of Labor Statistics (BLS) showed that nonfarm business sector labor productivity was unchanged during the first quarter of 2017, as hours worked and output both increased by 1.7 percent. 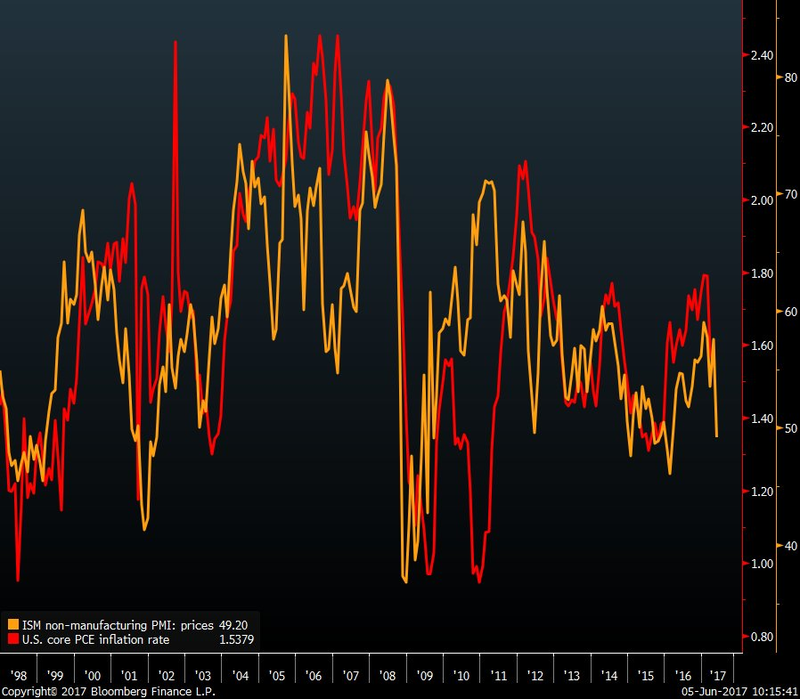 That was significantly better than the initial estimate of a 0.6 percent decline reported a month ago, and likely related to the recent upward revision to Q1 U.S. gross domestic product (GDP). However, the lack of productivity growth during the first quarter was still a big change of pace following the 1.8 percent and 3.5 percent gains seen during the previous two quarters. Moreover, productivity growth during the current business cycle has been notably weak compared to past expansions, which is discouraging because Federal Reserve Chair Janet Yellen described productivity growth as the “most important factor determining continued advances in living standards.” Muted business investment has been a major drag on productivity growth in recent years, as companies have relied more heavily on boosting staff sizes to meet increased customer demand rather than investing in technology and education to increase efficiency. On the bright side, the latest GDP data suggest that business investment in America is starting to improve. 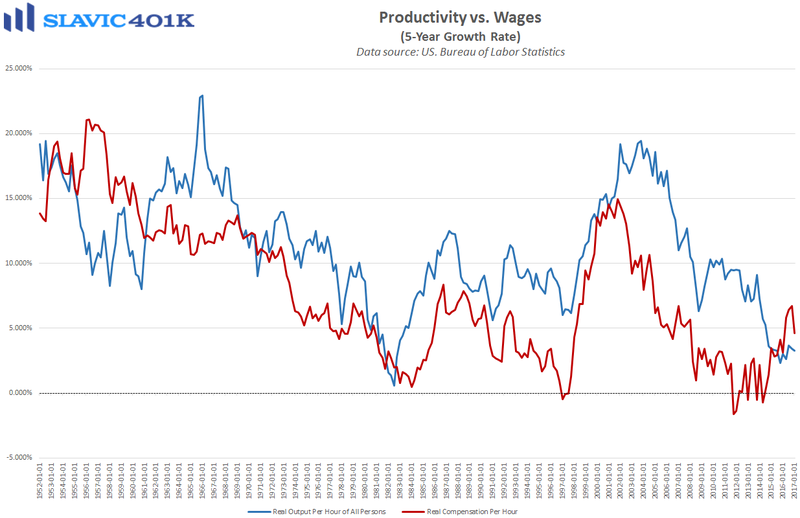 Add to that the pro-growth environment expected from the new administration and a real rebound in productivity may finally be possible.